Thanks, Chris. Note I've edited your post slightly, adding in a link to your original WUS thread. Hope that's OK with you. This didn't sound quite right to me, because, from memory, I'd always thought that 7A48-7000 / -7009 bracelets were two-tone. My end links are stamped with AA05B and, apart from "SEIKO" on the clasp and the arrows on the removable links, there's no other marking. Looking carefully at the middle bits, there is no sign of any colour other than s/steel. Although I've seen dozens of these on eBay over the years, I obviously hadn't been paying enough attention. 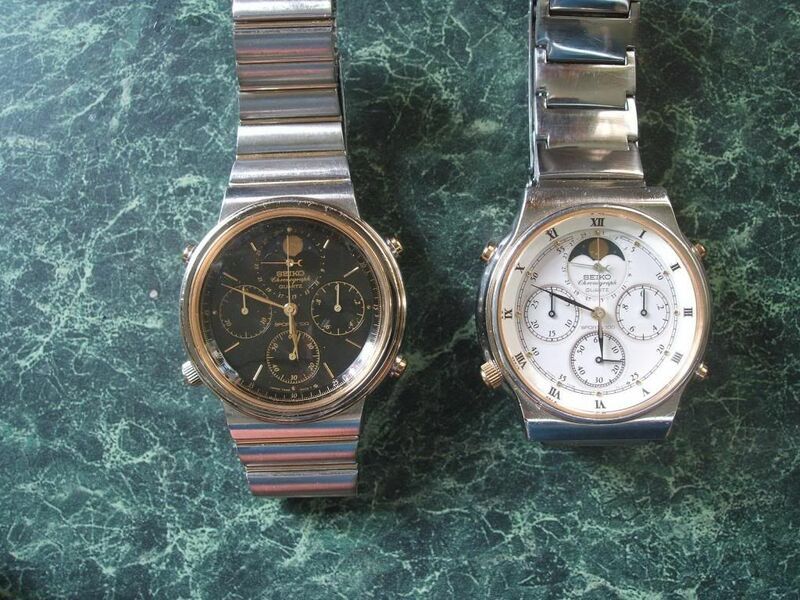 Naturally, I'd already sussed that the normal (European) export model 7A48-7000 only had SEIKO QUARTZ printed on the dial, and that the US export model 7A48-7009 had SEIKO Chronograph QUARTZ and SPORTS 100, but another different (all stainless) bracelet version ?? 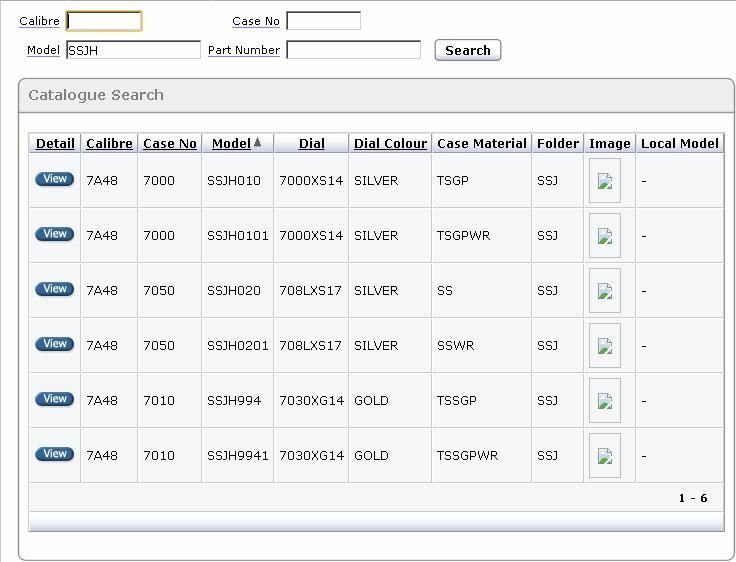 The first clue is in the part number AA05B. AA in general manufacturing terminology (at least as I knew it) means Altered Assembly. Look at the clasp. 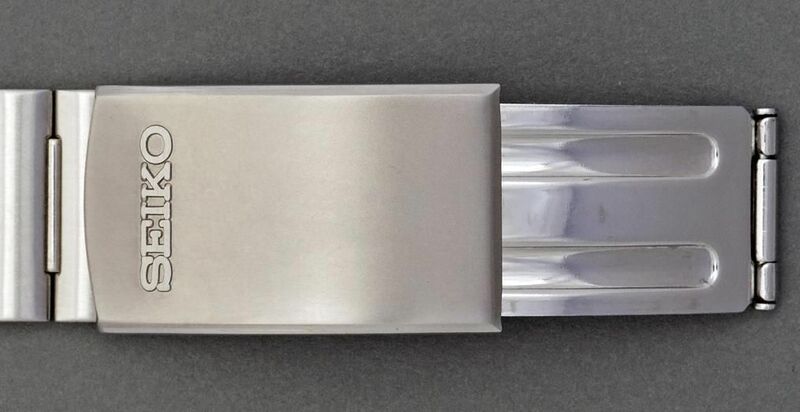 Instead of being the usual 35mm long x 16mm SEIKO SQ clasp with 7 pairs of adjustment holes, that was used on the 'normal' 7A48-7000 and 7A48-7009's Z1093C bracelet, it's a shorter 30mm 5-hole clasp closer with only 5 adjustment positions. The other clue is in its sales model code: SSJH010. SSJxxxx ring any bells with anybody ? You may recognise the next code down - it's the 7A48-7050 Fishing Master which I had always assumed was a JDM model. But it had never dawned on me before, that there might have been JDM variants of other 'more common' 7A48's - like the 7A48-7000. But that's what I reckon Chris' watch is. http://www.thewatchsite.com/index.php?topic=23669.0 (one offered FS on SCWF back in September 2011). 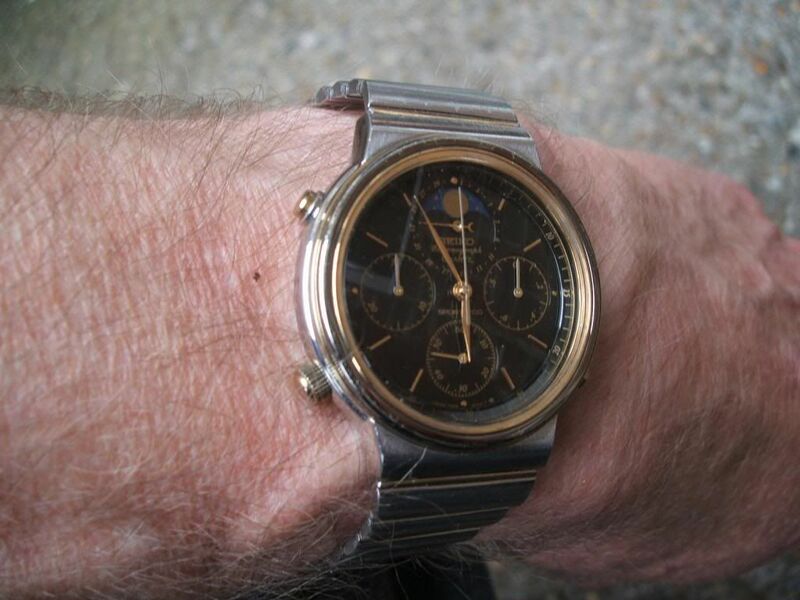 Something else worth mentioning, is that like many examples of 7A48-7010 I've seen (on eBay), this one also appears to have had all the presumably worn gold plating polished off the bezel. But I may be wrong about that last part. Look at that table again. It would appear that there were two subtly different versions of 7A48-7010 - but both with 'GOLD' dials. 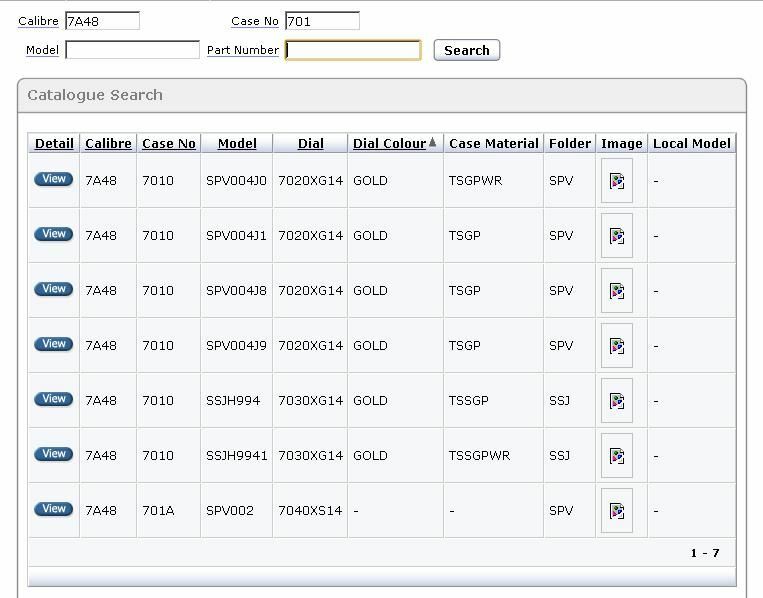 SPV004 is presumably the same as Pascal's example with the all-over gold plated bezel. The other product code, SSJH994 uses a different dial p/n 7030XG14, with a different presumably two-tone bezel p/n 82333543. Look closely at the dial in Pascal's 7A48-7010, and not only does it have SPORTS 100 printed on it, but you can read 7A48 7020. So presumably the other gold dial (not silver - it's a badly over-lit photo) without SPORTS 100 will have 7A48 7030 printed at bottom. I was actually quite close in what I wrote in this post, but didn't add 2 + 2 at the time. Now it's all beginning to make more sense. 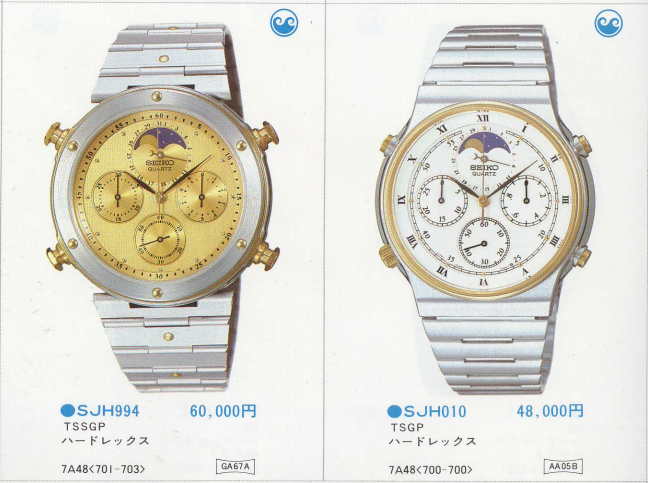 It's clear from the lack of gold plated bracelet joining links on the JDM 7A48-7000, that Seiko's marketing people decided to 'de-bling' the JDM version for their home market. That's exactly what they did with the gold dialed 7A48-7010. 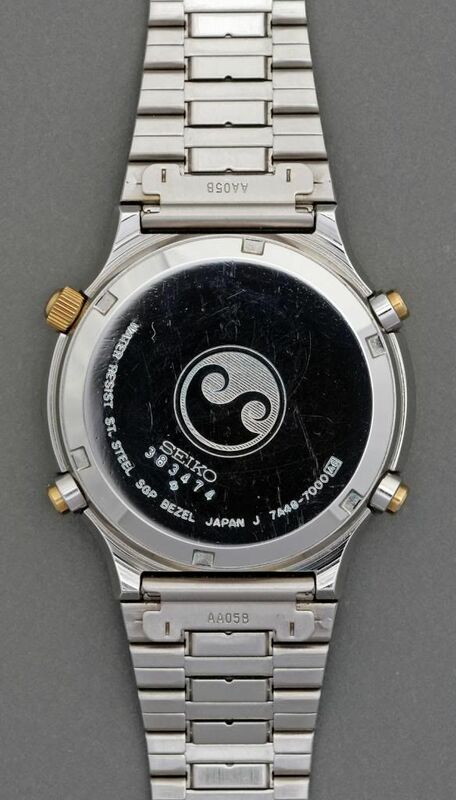 Instead of having the gold plated bezel, it uses the predominantly stainless bezel (with just the gold plated dummy rivets) used on the 7A48-701A (Seiko p/n 8233343). 7A48-7010 SSJH994 and 7A48-7000 SSJH010. Best I can tell, they first appeared in the 1983 H2 Japanese catalogue (on page 34). Well here is my second 7A48-5010 that I have just rebuilt, with a new glass from a scrap 7T39 and which has a slight dome to it and spare movement. The 7A48-7000 I have owned from new back in 1985, which I mainly wear with wrong bracelet fitted. Hello everybody, I am back! This time, I managed to get my hands on a 7a48-7000! I finally managed to go one step forward in the completion of my collection of Seiko chronographs, which I hope will include 1 watch for each model and series. "Seiko Chronograph Quarz Sports 100 Typ 7A48-7000 Nr. 793493 Bicolor Mit MondphaseVoll funktionsfähig, bis auf den großen Sekundenzeiger (klemmt) Die 3 kleinen Anzeigen funktionieren." 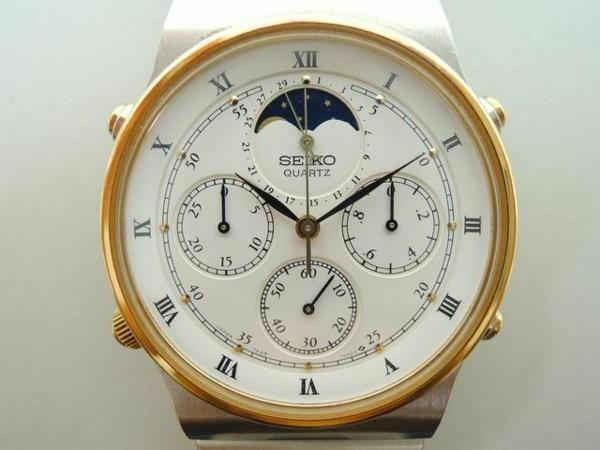 "Seiko Chronograph Quarz Sports 100 model 7A48-7000 Serial Number 793493 Two-Tone with Moonphase - Perfectly functioning except the central Seconds hand (it is jammed). The three small dials hands work fine." 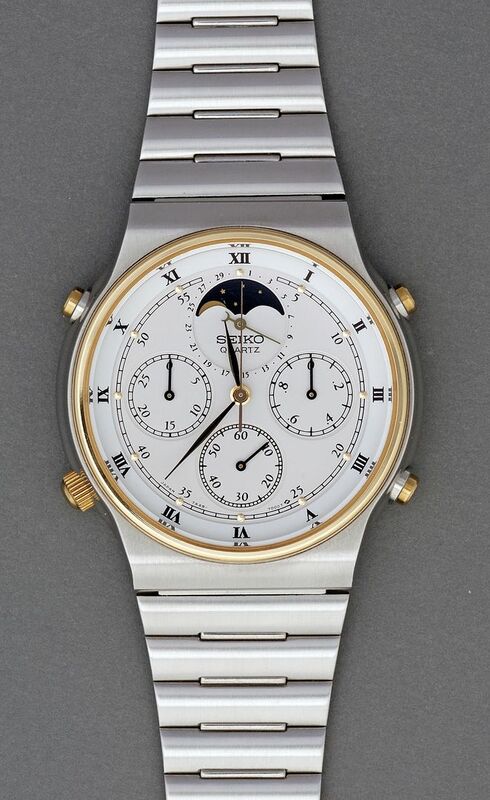 Considering the description, Probably the watch either needs a clean and oil service, or the chronograph button is jammed on the case, I could not really figure out what the seller meant. I will know better when I receive the watch, probably in a week or so. 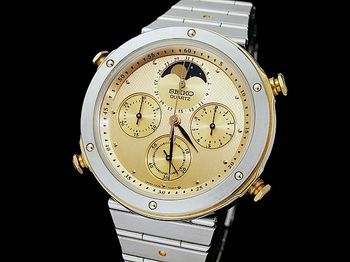 I am extremely happy for having won this watch, since it will be put aside my only other moonphase-capable Seiko, the 7T36-6A4A. And of course will allow me to continue with the "two-tone" series, together with the 7A34-7000 and the 7T32-6A50 I already own. I really hope the condition of the case and glass is good... New pics as it arrives, promised. Apologies for the slightly post, but it is 7A48 related. Quote: You will not find another like this watch in this condition. Reference 7A48-7009, A6. Currently @ $412 after 23 bids, with 12 hours of the auction still to run ! Yes serious money - for what is almost certainly the most commonly seen version of all the 7A48's. Sold for $515 (approx. £320) ! These regularly sell on eBay in the States, in the $100 - $200 price range and are quite common on eBay Germany too - usually around the 100 Euros mark. So if you picked yours up for only 30 Euros, George (and it's any good), you got yourself a bargain. Hi George. 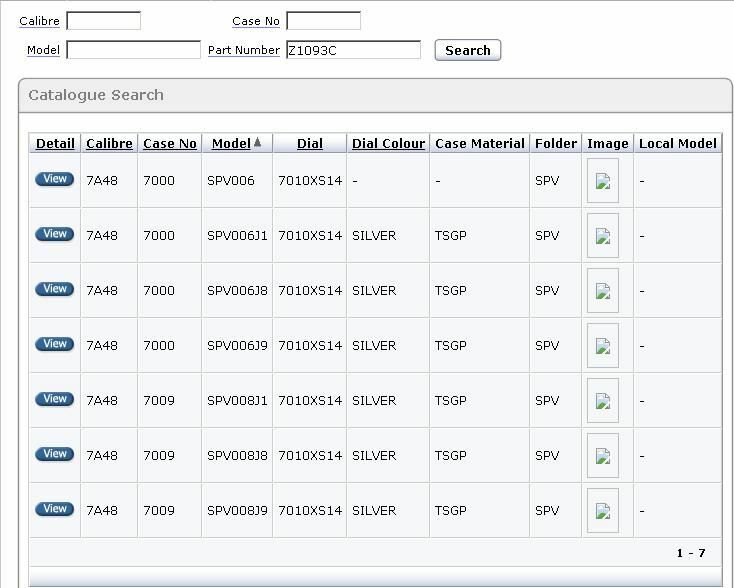 Looks like you have done well with your new 7A48-7000, hope you can fix the problem ok. I purchased this one from Japan, and also hoping there is not much of a problem with it. Stuart. So it follows, yours is a JDM version, Stuart. As Chris stated in his earlier post (quoted at the top of the page): Note there is no "SPORTS 100" or "Chronograph" dial inscription. The dials on those JDM 7A48-7000's look much nicer - far less cluttered, for the lack of the additional printing. IMHO. But I prefer it with the US market / normal export two-tone Z1093C bracelet, which matches the rest of the watch better. Indeed Stuart's version does look cleaner (the dial design) without the inscriptions. The 7A48-7000 I bought arrived today, faster than expected, and apart the chrono seconds hand which apparently is jammed (if I start the chrono, the small 1/10s hand starts correctly to turn, but the big seconds hand ticks back and forth, as if something is jamming the gears inside - which I hope is not the case) and really hard to push buttons, all functions work perfectly. the watch is really dirty, and the bracelet has seen better days, being somewhat stretched, but original (the part number is Z1093-E). The case itself is not in really bad conditions, though. the gold plating on the crystal bezel is worn out, sure, but there is still enough to see it. The crystal is full of scratches, and will need replacing, that's for sure! The dial itself is pretty clean, even if it shows some patina (yellowing) on all borders of the small dials, but a part from that, the watch is n overall good conditions. Considering I bought it for 28€ + shipping, I cannot complain This of course is a keeper, being my first 7A48. Will update with hi-res photos as soon as I manage to clean it. Probably the easiest fix ever? Before cleaning it, I wanted to be sure what I was suspecting was the case why the chrono seconds hand was stuck like that. I had a suspicion it was the Friction Spring for the Second Counting Wheel. I only needed to lift the friction spring a little with a screwdriver, and it went back in place. Obviuously, the chrono second hand is now working perfectly, as it should! Now time to disassemble, clean, reassemble, oil, and it's good to go, until I buy I replacement crystal, of course. The crystal has to be replaced, no question about it... All the rest is working fine, now: the buttons were only full of gunk, once removed and olied, the work perfectly, and so does the crown. I did not disassemble the movement yet, though, will wait until the battery runs out.